How do I enter and/or edit grades in the Gradebook? Sakai Community DocumentationSakai 19 User Guide (English) GradebookHow do I enter and/or edit grades in Gradebook? Gradebook allows instructors to calculate and store grade information for items that are completed either online or offline. Manually added items may be entered and edited directly within the Gradebook interface. Note: Grades that are being sent to the Gradebook from other tools, such as Assignments or Tests & Quizzes, are managed within their respective tools. You do not need to enter or edit them via the Gradebook. Sections/Groups - Select the desired section or group from the drop-down menu. Filter students - Type all or part of a student's name to filter the results. Click in the appropriate cell to enter a grade. Zoom: Click in the appropriate cell to enter a grade. You will see a spreadsheet view of all the existing gradebook items in your course. Click within the appropriate cell to enter a grade. The cell contents will change to show a score entry field out of the total number of points for that item. You may click out of the cell, select the Enter key, or use the up or down arrows to navigate to different cells. Gradebook supports spreadsheet-style data entry, similar to Excel or Google Sheets. Note: Items with the tool icon in the column header and grayed-out padlock icons in the cells (highlighted in yellow in the image above) are being sent to the Gradebook from other tools. You cannot edit those grades from the Gradebook, although you can view them from here. You will see a green check mark and highlighted cells displaying your changes to indicate when a grade has been saved. Set score for empty cells. Zoom: Set score for empty cells. 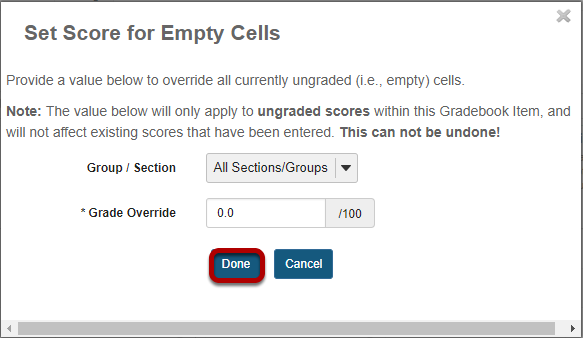 If you would like to set a score for all empty cells for a specific gradebook item, select the down arrow within the column header row and then choose the Set Score for Empty Cells option. Enter the desired score and click Done. To view the grade log, select the down arrow within the cell for a particular student score and then choose the Grade Log option. The grade log will display. The grade log shows any changes to student score, including the date and time of the change, as well as the change in score and the username of the user that made the change. 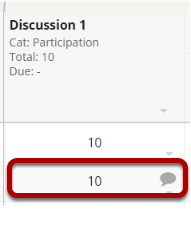 If you would like to enter comments along with the score, select the down arrow within the cell for a particular student score and then choose the Add/Edit Comment option. Enter your comment and click Save Comment. 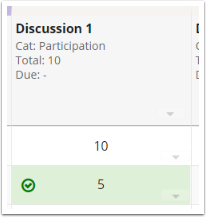 The comment icon will display within the cell, indicating that there is an instructor comment associated with the score. Click on the comment icon to view the comment. 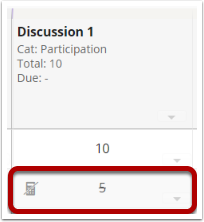 If you would like to excuse a student's grade for a specific item, select the down arrow for the student's grade cell and choose Excuse/Include Grade. The crossed-out calculator icon will appear in the cell, and the score will have a strike-through, indicating that the score is not being calculated in the student's course grade. 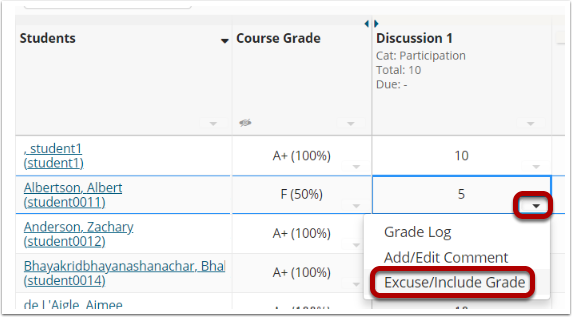 Item can be added back in the grade calculation by again selecting Excuse/Include Grade from the cell's dropdown menu. Prev: How do I add items to the Gradebook? Next: How can instructors customize their Gradebook display?